The Board Add-in for Microsoft Word allows integrating in, your MS-Word documents, Board objects such as DataView, Charts, Cockpits, Bubble Charts, which dynamically retrieve data from a Board database. 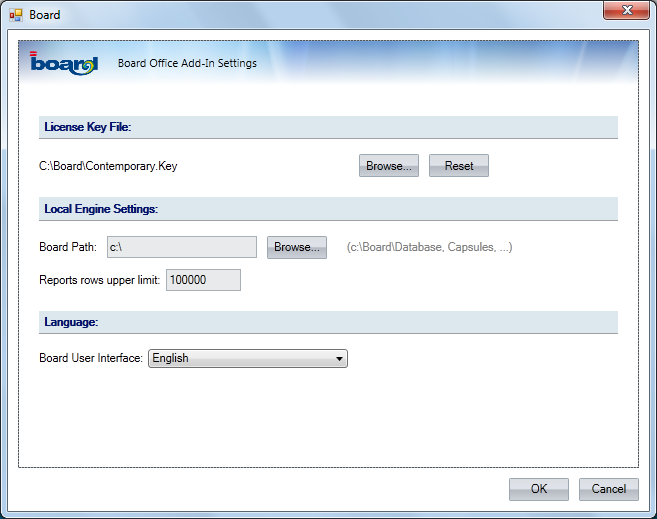 The Board Add-in for MS-Word don't support data-entry to the Board database. 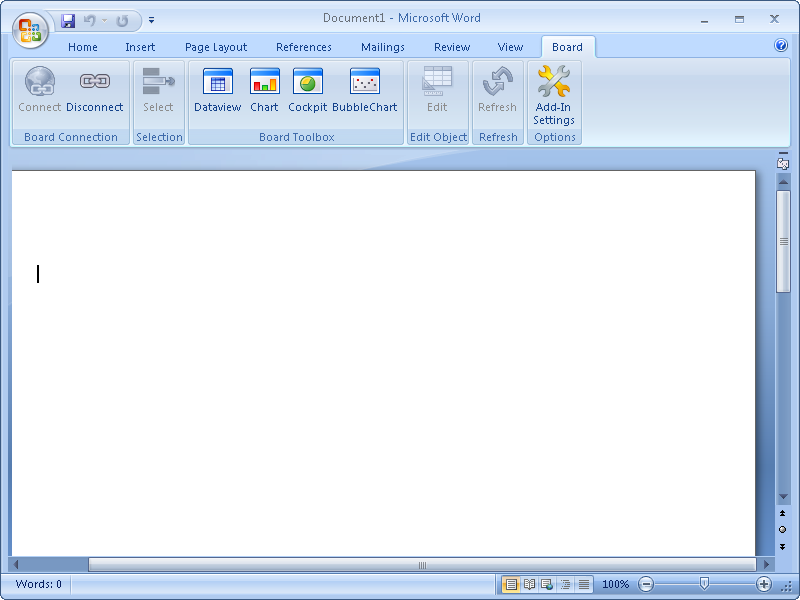 After having installed the Board Word Add-in, open Microsoft Word: the following picture shows Microsoft Word 2007 with the Board Word Add-In tab. A Board tab with features and functions to add and configure Board some of the objects (Dataview, Chart, Cockpit, Bubble chart), is added along side the other standard tabs of MS-Word. In the following paragraphs, the features of the Board add-in are explained. Board Connection: allows to connect to a Board Server or disconnect from the Board Server. resize the Board object as desired then press OK to insert the object onto the slide. When pressing the OK button, an image of the object is captured and is inserted on the slide, with the exception of the Dataview which is translated to a MS-Word table. When a Dataview is added to the Word document, the data returned by Board is added to the document as a Word table. 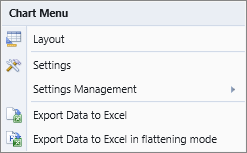 When clicking the Dataview icon, a pop-up windows with the layout object opens, as shown. As illustrated above, the Layout configuration contains a drop-down list to allowing to set some format settings for the Word table. If you change the format of the Word table (font, colours, etc..) using Word table format functions, note that when refreshing the Dataview these settings will be lost and overwritten by the Board format settings. Clicking on the desired icon, a pop-up window opens, allowing to configure the Layout and other object options. re-size the Board object as desired then press OK to insert the object onto the slide. When pressing the OK button, an image of the object is captured and is inserted on the slide. 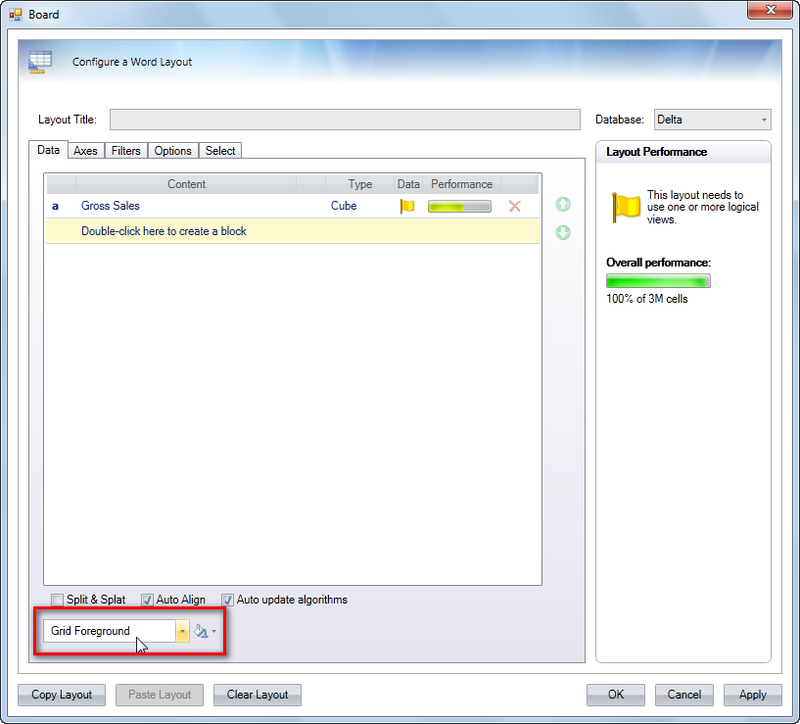 When clicking the OK button of the configuration window, an image of the Board object is inserted into the Word document at the position of the cursor. 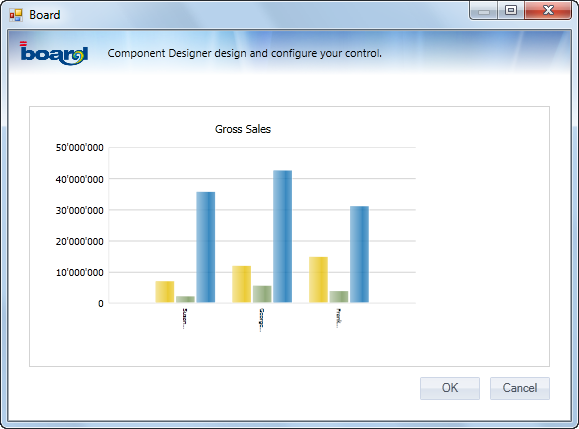 The above example shows a Chart object, the same considerations apply to for the Cockpit and Bubble Chart objects . This function re-runs all Layouts in the MS-Word document, refreshing the data contained in the Board objects.